13 April - After a couple of days with a strong, cold breeze from the north-east, today was a bit less breezy and much more comfortable, and I spent much of the day out in the garden getting on with tidying up the garden. It did mean that I didn't spend much time watching rather than doing. There were at least six solitary bees active around the bee hotels, and numerous hoverflies, but it was the arrival of not one but two Bee-flies that had me swapping my tools for my camera. 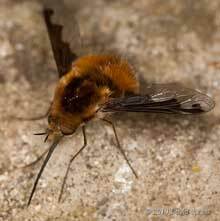 While I have become used to seeing a single Bee-fly in late Spring, but this morning was the first time I've seen two. They got close to each other but I saw no signs of any interaction between them. The easiest opportunities to photograph them come when they land on paving stones to sunbathe. As well as absorbing some of the sun's energy, an individual will sometimes also take time to clean their outsized proboscis. You can see yellow pollen on this one. 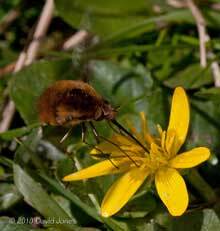 On a quiet day you can hear the buzzing of a bee-fly's wings as the insect darts between flowers. I find that in our garden their preference is for Lesser Celandine and then Dandelions, but it seems that the flowers must be in direct sunshine. I have yet to see one visit a flower that is in the shadows. When they visit a flower I never see them land properly. The wings continue to work at high speed and the insect usually hovers with its front four legs holding onto the flower head as it probes with its proboscis. In this second picture of feeding in progress you can see that the tip of the proboscis is divided. 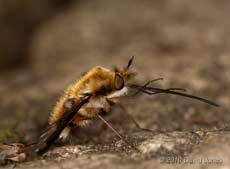 I'll need to do a bit of research to check on the structure of the proboscis in the Bee-fly. Also, I'll be watching out for more photographic opportunities to attempt to record this again. 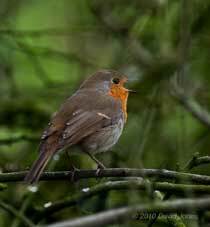 Going back to yesterday, during the first part of the morning the male Robin was very agitated at the bottom of the garden. I couldn't see a reason for this, but in the afternoon I spotted the female collecting moss from the banks of the big pond. I guess that whatever happened in the morning, it caused her to abandon her nest. By the afternoon the male too had got over whatever had been the earlier problem and was singing again. A look at the veranda this morning confirmed that we had a hedgehog visitor last night - it fed on peanuts and sunflower kernels, and defecated. 14 April - A grey and quite chilly day with just a few glimpses of sunshine during the afternoon - disappointing, with only the occasional bumblebee to be seen flying between the flowers. 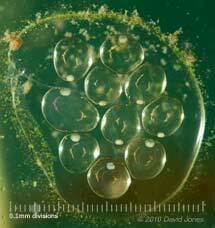 A follow-up to the photographs I took back on the 10th of pond snails mating - this morning there was this group of snail eggs attached to the glass of the aquarium. Of course, I cannot be sure that these eggs are a result of the mating I recorded. In each egg the embryo is no more than a tiny cluster of white cells. I hope to follow their progress over the days to come. 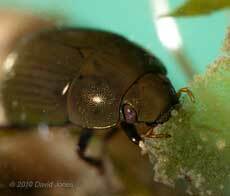 Also in the aquarium is this water beetle which I think may be Hydobius fuscipes. 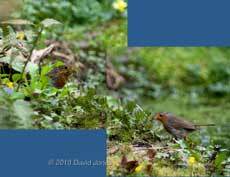 These have been present in the big pond for several years now, and I first took photographs of them in 2008. It is a species that doesn't have swimming legs so makes it way around by crawling amongst the pond plants, although when it needs to return to the surface to breathe it can simply let go! When it does get back to the surface it doesn't just breathe but also collects a surprisingly large bubble of air against the underside of its body. 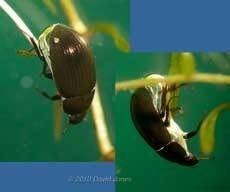 Watching the beetle descending a plant it was clearly having to take care to avoid dislodging some of the air! The hedgehog was here again last night. 15 April - A bright , sunny morning with the prospect of a day (or at least an afternoon) without vapour trails, and slightly quieter as British controlled airspace is shut down thanks to ash from an Icelandic volcano - now if only it could also have affected road traffic for a few hours! Before I forget, a hedgehog was here again last night so it looks as though we are once again on the list of gardens to visit! There was another butterfly here today and am cursing not having a camera at the ready. A very tatty Painted Lady settled on some wood scraps that I put out to dry. The strong north-easterly breeze makes it very unlikely that it is an early migrant, suggesting that this individual may have hibernated in the UK. There is no doubt about its identification - We saw hundreds of Painted Ladies in Cornwall last May. I really do wish I had been able to take a photograph to confirm the sighting. 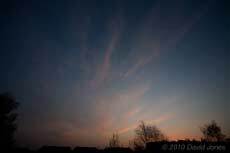 Much of the day was taken up doing more sorting and tidying in the garden, and the difference in the sky above us was noticeable, at least from the late morning onwards. 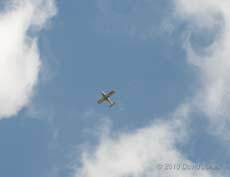 Not that the skies were completely devoid of aircraft. It seems that small, private aircraft were still able to fly at no more than around 3000ft, as far as I can tell, and a few military helicopters passed us by, but it was the first time I can recall seeing the sky so clear of planes for so much of the time. 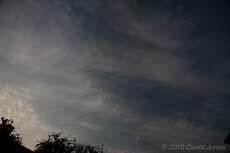 During the afternoon there was broken cloud at low levels but these moved away in the early evening, revealing wispy high level formations which, if the forecasts were correct, could have contained some of that volcanic material. and this is the view to the North, the direction from which the clouds are moving. Looking towards the West with the sun already below the skyline, I hoped that there would be a good sunset. it only became a bit more colourful before things started to dim. Disappointing, but no vapour trails! 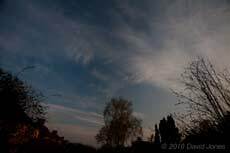 With the UK airspace closed until at least 7am tomorrow, and the sky almost clear of cloud after dark it should be a good time to spot satellites while there will be no aircraft lights to confuse. I hope to catch up with the large pictures tomorrow. 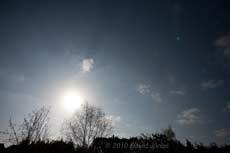 16 April - A bright, sunny, if breezy day with some puffy clouds low in the sky but virtually nothing high up, thanks to the airspace closure, which will continue until at least tomorrow morning. As I mentioned yesterday, it seems that light aircraft can still fly at low altitudes, but I only saw a few of them today. and finally, facing North. There is (usually) always traffic going East or West, as well as aircraft going to or from Heathrow. And of course we have Farnborough just to the North of us, and that seems to be out of action too. 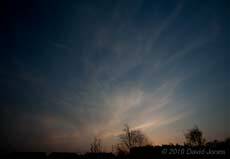 There were none of the high wispy clouds that we saw yesterday evening. Thinking about them later in the evening I wondered if some of those could have been 'left-overs' of clouds created by vapour trails earlier in the day somewhere off to the north-east. 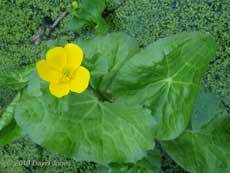 Back to the garden where the first Marsh Marigold flower has opened today. The quite strong breeze and cool temperatures seemed to keep most flying insects away, apart from the bumblebees that took full advantage of the flowers on the sunny side of the garden. I decided to try again to capture a picture of the small black bumblebee that visits the Cowslips in preference to other flowers. This time I had better luck and caught this one as it approached a flower. Usually I see the long proboscis extended before it lands. In this case the bee seems to be wiping the proboscis with its fore legs. To give an ides of its size, the flower measures approximately 2cm long (not including the flower stalk), which means that the bee must be no more than 12-14mm in length. As it flies, this bumblebee has a loud buzz that is higher in pitch than that of the larger Buff-coloured Bumblebees so I thought I'd point my microphone at each of the species I see here. I was able to start with the black bumblebee this afternoon and the result was interesting. You can hear the recording here (40 seconds - 638KB). 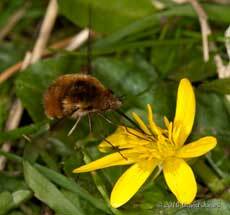 It starts with a Buff-tailed (or similar) bee that was 'wandering amongst the Fritillaries. 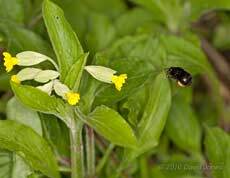 However the Black bumblebee arrives quickly and immediately darts from one Cowslip flower to the next. When the loud buzzing stops the bee has entered the flower head. There is a pause and then you can hear a much quieter, higher frequency buzz while it is still in the flower head. Apart from a gap in the middle of the recording when the bee moved away form a few moments, the rest of the clip is in real time. 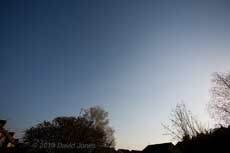 17 April - A whole day with not a single cloud, high or low, in the sky. 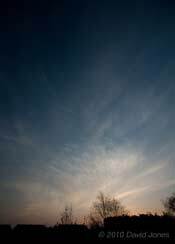 I couldn't resist one more 'quiet skies' picture, although this time it's a composite image taken not from the garden, but a lay-by on what is known as the Hog's Back, a main road that runs east-west along a high ridge to the south-east of Aldershot. Despite the impression that you may get from the picture, the road behind me is straight, and I'm facing just slight east of north. And of course, the sky above the pictures, and behind me was just as clear! This area of sky is usually pretty busy with Heathrow to the north-east and Gatwick to the east-south-east, over my right shoulder. 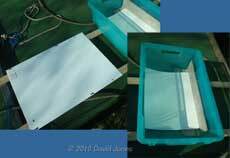 With reports that some of the volcano's dust is now falling to ground I've put a white enamelled steel sheet, and a plastic sheet on the caravan shelter roof to see if they 'catch' anything interesting besides pollen and other dust over the next few days. 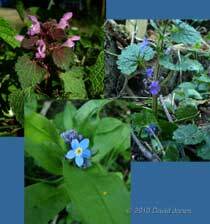 Several flowers have come into flower over the last couple of days - Red Deadnettle, Ground Ivy, and today the first Forget-me-not. A different sort of 'flower' has appeared at the side of the big pond, in the area nearest the house where the water has given way to vegetation. 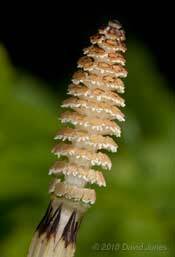 Not really a flower at all, but a stalk topped by a strobilus, which has been produced by a horsetail to reproduce by releasing spores. Much of this area of the pond is covered with moss, and in several years we have been lucky enough to have a Carder Bee nest built in that moss. Well, it looks as though we may well get one this year. Several times today I took time to kneel down to watch and listen as a Carder Bee (possibly the one I saw scouting out the area yesterday) worked on digging its way under one area of moss. Listen carefully and it is actually possible to hear it tearing at the moss! And just a short way along the side of the pond a solitary bee has been burrowing. That spot is now protected by a short bit of fencing (old knitting needles and string!) as the spot could easily be trodden on.